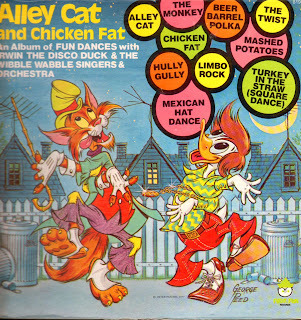 Here's a different "Alley Cat and Chicken Fat" album, this one tied in with Irwin the Disco Duck. I have no idea why, since none of these songs come close to replicating disco! We do get Irwin's original Donald-like voice though, so it sounds like he's introducing the Wheelbarrow Polka. Another interesting thing which I've included with the file: apparently there was a comic story of sorts on the back covers of the albums. This one features the unusual conclusion to it. Anyway, sorry for the long absence, and I hope you like the album! My second grade teacher had this album. Kinda creepy to hear it again after 27-is years. Oh muh gosh! I can't tell you how happy I was to find your blog! I've been looking all over for this album that I adored as a child! I'm still on a search to find an old mint condition vinyl copy (I think my parents gave mine way when I was older), but thanks to your MP3s, I can reminisce while searching for the a used album! Thank you so much!! !